Athletic trainers are healthcare professionals who render service or treatment under the direction of, or in collaboration with, a physician in accordance with their education and training and their states' statutes, rules, and regulations. Services provided by athletic trainers include injury and illness prevention, wellness promotion and education, emergent care, examination and clinical diagnosis, therapeutic intervention, and rehabilitation of injuries and medical conditions. Students who want to become certified athletic trainers may earn a single M.S. degree or pursue the combined degree program that includes a B.A. in Health and Human Physiology (exercise science track) and the M.S. in Athletic Training. See the B.A. in Health and Human Physiology (exercise science track) in the General Catalog. 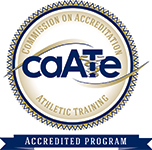 The University of Iowa is accredited by the Commission on Accreditation of Athletic Training Education (CAATE). Our vision is to be the program known for producing highly competent athletic training practitioners who are committed to continual learning and dedicated service to the diverse healthcare and safety needs of their patients. Our mission is to blend high quality education together with exemplary clinical experience creating a seamless environment where student growth and development are natural outcomes. We aspire to be the model for clinical education that promotes interprofessional collaboration that impacts the future of healthcare. We achieve our mission by maintaining Iowa traditions, striving for excellence through continuous improvement, and incorporating clinically relevant research to be innovative. The program will facilitate student knowledge and clinical skill development among diverse populations. The program will maintain an 80% retention rate. The program will facilitate direct engagement and learning approaches to healthcare that will add to successful professional development through inter-professional experiences. The program will publicly disseminate scholarship based on clinically relevant research in athletic training to enhance engagement and produce creative works to support learning.